As I mentioned in a comment on Mark Perigard‘s blog the other day, I’m still collecting olf Justice League of America and Green Lantern issues from the 60s and 70s, and recently picked up JLoA #113 and #114, two of the 100 Page Giants that DC were doing in the mid-70s. Flipping through the issue made me realise just how different things are these days, over 40 years later. As well as an all new story featuring the League, a Justice Society reprint and another reprint from an early issue of JLoA (the classic Crisis on Earth-Three), #113 also had a handful of other . . . errr . 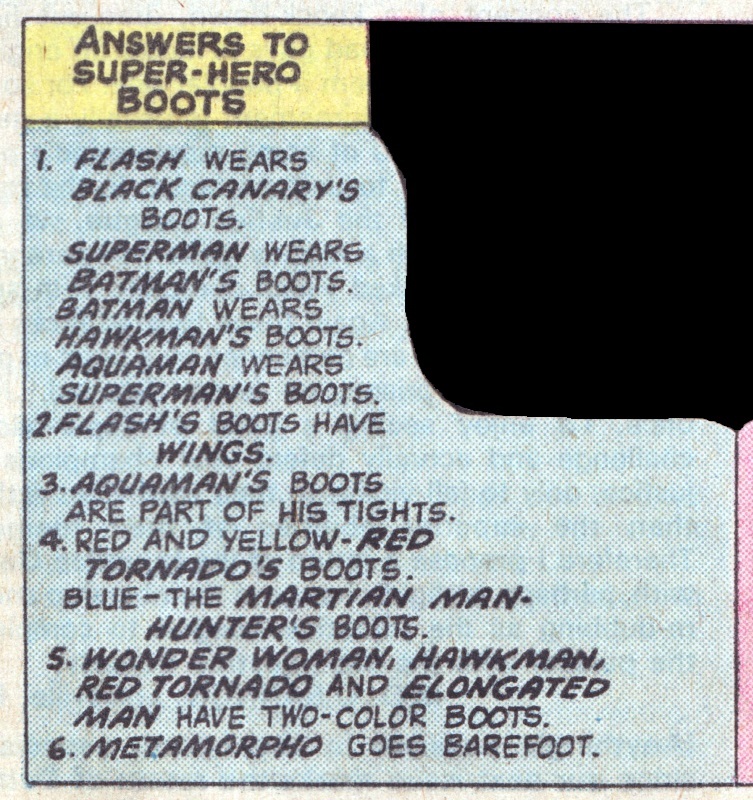 . . features like the quiz about which boots the League members wear. Seriously – this was a big enough deal that it was promoted on the cover!! I’m guessing this was long before DC started bragging that comics weren’t just for kids. Of course, I can’t mention this without offering you the chance to compete, so here’s the quiz – remember, you need to think as though you’re reading this in 1975. Answers after the fold. Have your guesses ready? Click below for the answers. Oh, the 1970s . . .
Posted on Friday, December 22, 2017 Thursday, December 21, 2017 by GaryPosted in UncategorizedTagged Justice League, The 70s. Ha ha, damn. Well ok. So either an editor just happened to probably read a fashion mag like Cosmo, and thought this might be a fun little bit for the kiddies, or it was unofficially a Canada Day issue, you know ’cause they’re always going on A-BOOT something or another? Yeah, that’s just as bad as as the quiz. I think I can use that quiz and rework into something a little bit more suited for my humor though. Oh, and you know what? I say, just for shits and giggles, all incoming editors and editors-in-chief should be required to take this quiz. If they pass, they get the job, if not, they get the BOOT…..
Feel free to take that quiz and run with it! You know – run – with boots on! 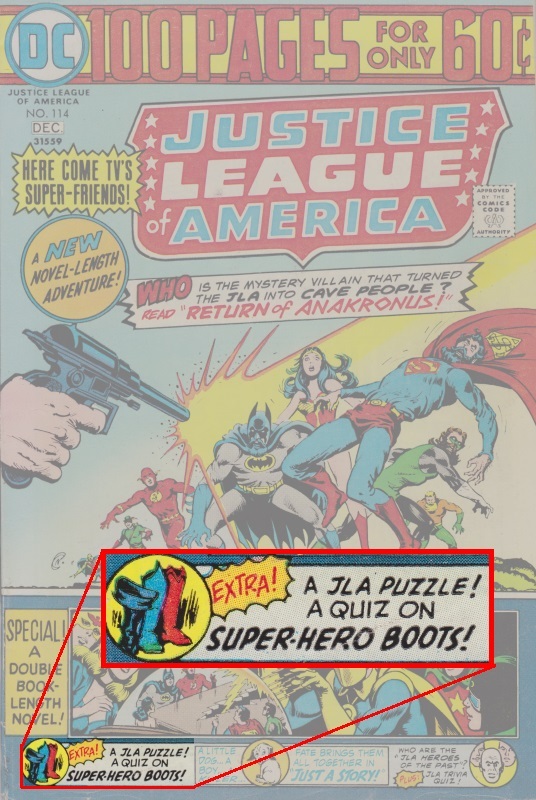 Apparently so many readers flunked the quiz that DC was unable to print the follow-up quiz in which you had to guess who was wearing what underwear. I will always love and miss the 100 Page Super-Spectaculars. After re-reading that quiz, how were kids supposed to know about Metamorpho? I thought he turned down membership initially until the 80’s? 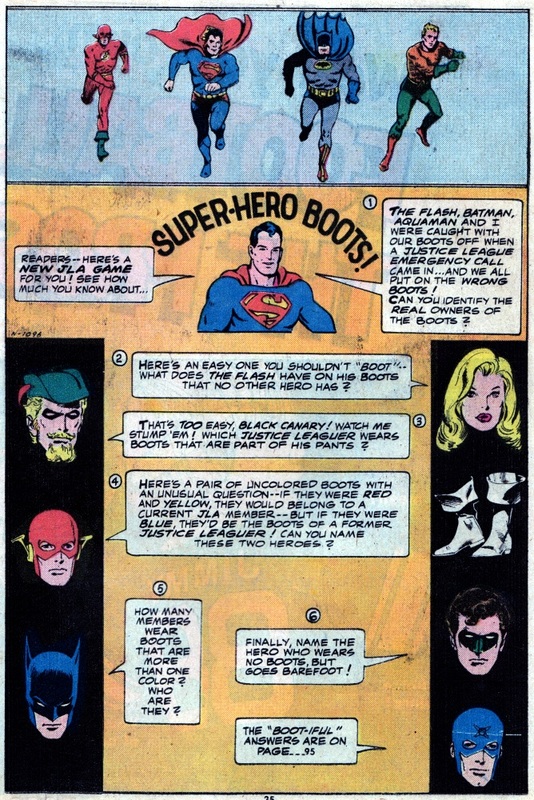 What exactly were Superman, Batman, the Flash and Aquaman doing that they weren’t wearing their boots? Think about that one for a second. Yeah, that struck me, too – Metamorpho wasn’t a member of the JLoA. “What exactly were Superman, Batman, the Flash and Aquaman doing that they weren’t wearing their boots?” – stamping on grapes to make wine the old fashioned way? Sureee, yeah, let’s go with that one, ha ha. Crisis on Infinite Earths #1: The Summoning!